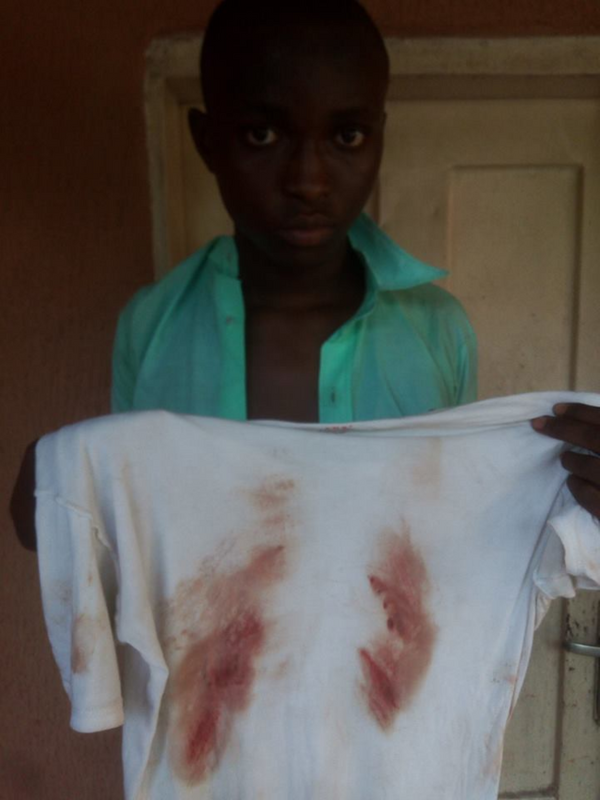 My younger brother was mercilessly brutalized by soldiers for not wearing complete school uniform. This incident happened yesterday and I was so mad about it, not just because My brother was brutalized by soldiers but because I couldn't do anything about it. If it was in a private school, I would have gone there to raise down the roof but the school is been run by the military. 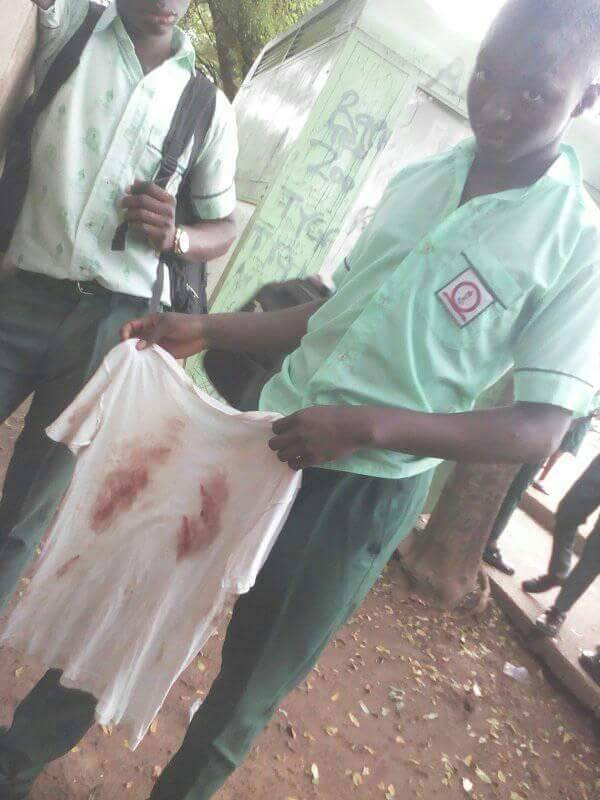 I remember some years ago, when I was in the school, a man came to the school to make complaints of how his son was brutalized, the man was also humiliated by the school. Even at that, knowing I can't do any damage to the school, we also don't have a lot of money to press charges. I still couldn't sit on my balls and let the matter fade away just like that. I went on facebook and make a write-up about the scenario and thanks to the wonderful friends I have there, they kept on sharing it until it got to almost every local blog in Nigeria. "My younger brother just came back from school now, only for me to see his body in pieces like how soldiers butcher Biafran agitators. Coz I couldn't figure out any other offence that would warrant this kind of injury. 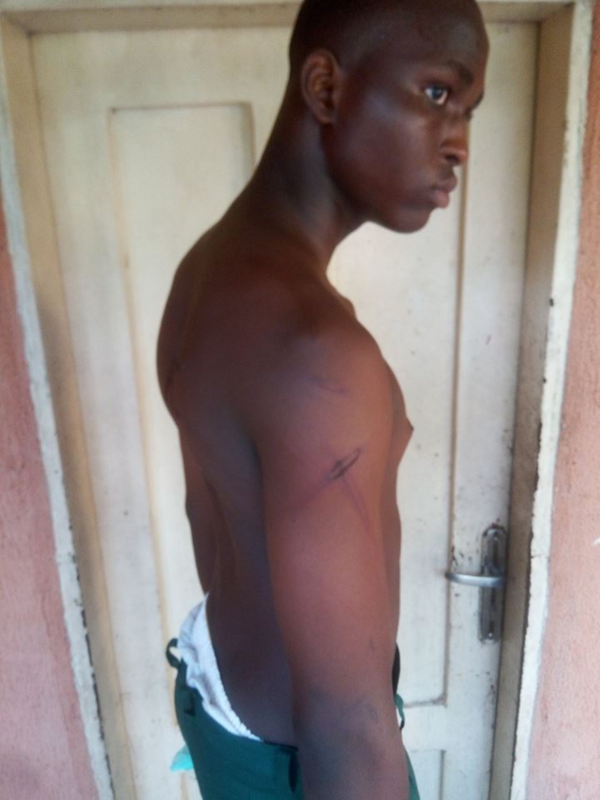 Even fighting with a fellow student wouldn't warrant to this extent of flogging. Maybe he must have fought a solider or beaten their Commandant. I was still wondering what kind of offence he must have committed while waiting for his reply. "No... I was told to kneel down at the gate for..."
Is that what would warrant such level of flogging? He was asked to remove his shirt and was flogged to the level that his body was dripping blood but they still didn't stop. 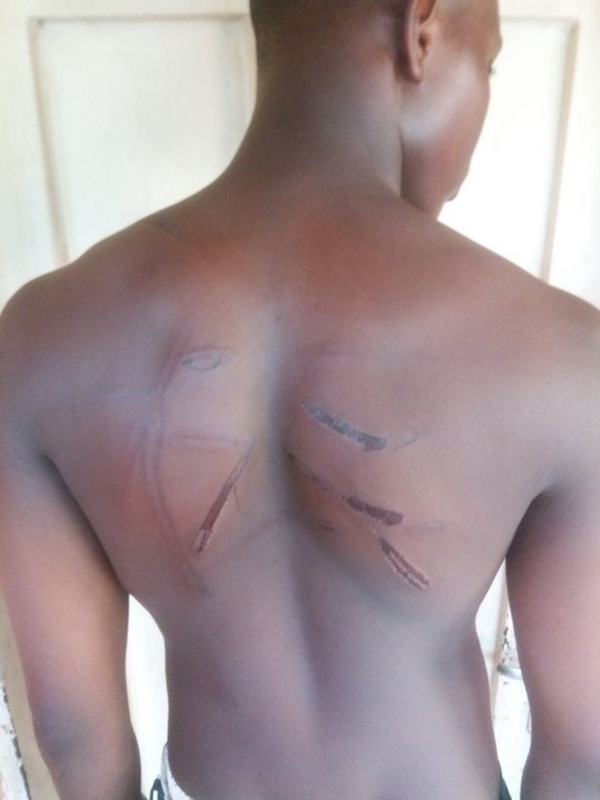 Even after they finished flogging him, He wiped off the blood stains, wore back his white vest and another set of blood stained his vest to that extent. "Why did you put your child in a military school in the first place?" Thunder will fire you in advance. Command Day Secondary School Enugu is not Nigerian Defense Academy where parents sign the death warrant of their children before they can be admitted. It is just like every other school, just that it is been run by the military to increase discipline. Which they have failed woefully. Even a blind man living in Enugu knows that school is first class in fighting other schools like Fedi, Unsec, Magnet, etc... The students occasionally chatter buses and transport themselves to another school to fight. Yet the soldiers can't and won't do anything about it till today. The soldiers and well-painted walls of the school is just a packaging to make parents believe the school is quality enough. After paying a huge amount of school fees that increases every year, that school cant boast of 20 well functioning computers. Students are asked to bring their laptop to school during computer exams. Subjects like ELECTRICAL INSTALLATION which is been studied from ss1 to ss3 is been taught by only one teacher since 2014 till date... I can count how many times we had the class throughout my stay in the school. We paid for our practical equipment. Same as in Technical Drawing. The school gives student under-size sport-wares and flog them for not wearing it on sports day. Whether you like it or not, you pay for a new uniform every 1st term but school uniforms are only given to jss1 and ss1 students. Yet, with all these ambiguous fees the school charge, parents can't have peace of mind each time they send their children to school. Is violence the only way to resolve an issue in that school? My dad and elder brother went to the school this evening, only for the Admin officer that ordered the beating to tell them that he got what he deserves for running away. Well... We are bloody civilians, what can we do?" Your UA account score is currently 2.191 which ranks you at #20848 across all Steem accounts. Your rank has improved 194 places in the last three days (old rank 21042). In our last Algorithmic Curation Round, consisting of 471 contributions, your post is ranked at #418.